Angela Clemente in her home office. In 1999, she was tipped off that one of the defendants convicted in a gangland murder, Anthony Russo, had supposedly been wrongly accused. At the end of February, a 300-page report, tersely titled, “New York Systemic Corruption,” was received for review by the Justice Department’s Office of the Inspector General in Washington. In three bound volumes, it detailed a series of oft-made, and explosive, allegations: that in the 1990s, while trying to stem the Colombo family war, federal prosecutors and agents for the Federal Bureau of Investigation in New York knowingly allowed two moles in the mob to kill while they were on the government’s payroll. Ms. Clemente's main focus has been the F.B.I.’s entanglements with the mob. She has looked at ties between R. Lindley DeVecchio, who ran the F.B.I.’s Colombo family squad, and Gregory Scarpa Sr., a Colombo family captain, who was secretly serving as the agent’s mole. But the dossier had not been sent to Washington by one of the defense attorneys or professional private detectives who have, for two decades now, been working on the legal cases related to the war, an internecine struggle from 1991 to 1993 that resulted in a dozen deaths and more than 80 convictions. It was sent from an unlikely, and mostly unknown, source: a 5-foot-4, single mother from New Jersey named Angela Clemente. 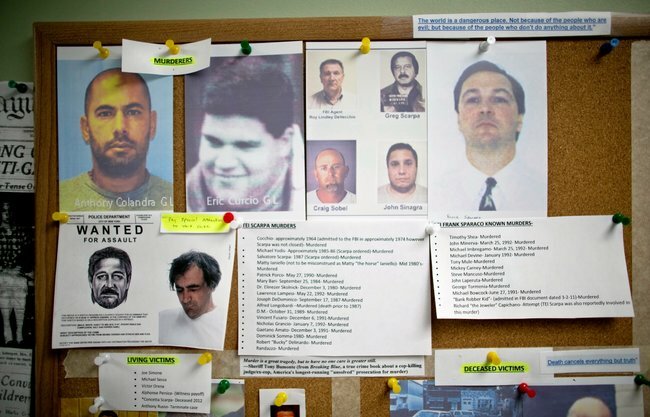 For nearly 15 years, Ms. Clemente, 48 and a self-professed “forensic analyst,” has waged an independent and improbable campaign to prove that the government turned a blind eye to as many as 39 murders committed in New York by turncoat gangsters it paid to work as informants. Through interviews in the underworld and by prying loose documents from classified archives, her unusual citizen-sleuthing has taken her deep into the local version of the James "Whitey" Bulger case, which is now being tried in Boston. Not only into the annals of the New York mob, but also, in a strange, octopus-like fashion, into corollary inquiries into Islamic terrorism, the Kennedy assassination, even the 1995 bombing of the Alfred P. Murrah Federal Building in Oklahoma City. A onetime medical technician who in her 30s studied to become a paralegal, Ms. Clemente is not your typical gumshoe. For one thing, she tends not to work for criminal defendants or their lawyers, opting instead to send her findings to public officials, like Mr. Rohrabacher, hoping to prompt Congressional hearings or legislative change. For another, when she isn’t in Washington or visiting federal prisons, she lives in Tuckerton, N.J., north of Atlantic City, and cares for her autistic brother Miles, 47, and 15-year-old son Santo, who has a rare autoimmune disease. It was more or less by chance that Ms. Clemente found her mission in 1999, when she was working from home, in Toms River, N.J., helping prison inmates file transfer requests or obtain better medical care. A member of the Gambino crime family discreetly sought her out, she said, and suggested she investigate the gangland murder of John Minerva, a Colombo soldier shot at the height of his family’s civil war while sitting in a Champagne-colored Cadillac outside a coffee shop in North Massapequa, N.Y. The mobster told her that one of the defendants convicted in Mr. Minerva’s death, Anthony Russo, had been wrongly accused. She also didn’t know that Mr. Russo’s conviction, in Brooklyn in 1994, was linked to one of the most extraordinary — and litigated — tales in New York Mafia history, the epic saga of a convoluted and allegedly compromised partnership between a lawman and a hit man: R. Lindley DeVecchio, a streetwise agent who ran the F.B.I.’s Colombo family squad, and Gregory Scarpa Sr., a Colombo family captain, who was secretly serving as the agent’s mole. Before Ms. Clemente arrived on the scene, New York’s finest lawyers had been chasing hints for years that Mr. DeVecchio was corrupt and had allowed Mr. Scarpa to kill his rivals during the Colombo family war and pin some murders on men who were not involved. The lawyers’ efforts were more than a simple search for truth; if Mr. DeVecchio was in fact tainted, then a cadre of Colombo gangsters that he had helped imprison might go free. Using the Russo case as an entry point, Ms. Clemente began to examine the tangled bond between Mr. DeVecchio and Mr. Scarpa, an expert assassin known as the Grim Reaper. Overwhelmed by its complexities, she soon sought help from an unusual source: a Yale-trained scholar and former Michigan state official named Stephen Dresch. This odd couple — Ms. Clemente was heavyset at the time and nervous; Dr. Dresch wore bathrobes and a Unabomber beard — spent six years going through the case file and re-interviewing witnesses. Finally, in 2005, they sent their findings to Representative William D. Delahunt, a Massachusetts Democrat who was then holding hearings on corruption in the Boston office of the F.B.I. In an interview last month, Mr. Delahunt, now retired from Congress, said that he referred their work to Charles J. Hynes, the Brooklyn district attorney, and in 2006 — just before Dr. Dresch died — Mr. Hynes’s office indicted Mr. DeVecchio on charges of helping Mr. Scarpa commit four murders while he was an F.B.I. informant. By 2010, Ms. Clemente had identified a second mob informant who worked with Mr. DeVecchio: Frank Sparaco, a Colombo family killer. Just this March, he came forward in a jailhouse affidavit supporting her initial claim: that Anthony Russo was not involved in John Minerva’s death. Three weeks ago, her investigation took another startling turn. Ms. Clemente’s lawyer, Jim Lesar, said that the government, again responding to her Freedom of Information Act request, had agreed in principle to give her a trove of 50,000 pages of previously unseen documents. Who knows what they might reveal? Given her status as an outsider in Brooklyn’s legal circles, questions have always swirled around Angela Clemente. Where does she come from? How does she support herself? And most of all, Why does she do what she does? Ms. Clemente was 11 when her parents divorced. Her mother remarried — “A biker, he was crazy” — and Ms. Clemente claims that her stepfather sexually abused her through her teens. At age 18, she fled her family’s home in Daytona Beach, Fla., and moved out on her own, finding work as a hospital technician. In 1986, when she was 22, Ms. Clemente gave birth to a daughter she had with a man who had a job installing air-conditioning units. When the girl turned 4, the man was charged with sexually assaulting her. Within a year, the charges were dismissed. Ms. Clemente claims that the local prosecutor’s office mishandled the case. In the wake of the case’s dismissal, Ms. Clemente and her daughter — now in her 20s and living on her own in New Jersey — moved to Colorado, where Ms. Clemente studied to become a physician assistant. They wandered north to Seattle and then south to Los Angeles. Returning to Seattle, in 1998, Ms. Clemente got pregnant again, after an encounter with a stranger, and Santo, her son, was born with a rare disease that afflicts him with blisters if he stays too long in the sun. Among them was Mr. Russo, a Colombo family captain whose conviction in the Minerva murder launched Ms. Clemente on the twisting path toward Mr. DeVecchio. On June 16, 2006, three months after Mr. DeVecchio was indicted, Ms. Clemente said she found an anonymous note on her car, summoning her to Brooklyn, from someone claiming they had information about the Minerva case. She went to the Caesar’s Bay Bazaar off the Belt Parkway and, hours later, a passer-by found her sprawled unconscious in the parking lot. Mr. Vecchione, the same investigator who had thanked her months before, told reporters at the time that Ms. Clemente had choke marks on her neck, cuts and bruises, and a large welt on her stomach. “I think I was getting too close to that case and someone didn’t like it,” Ms. Clemente said. The Brooklyn district attorney’s office still considers the attack to be unsolved. For a woman ostensibly in possession of a rigorous sense of right and wrong, it remains a question as to why Ms. Clemente has persistently pursued evidence that could result in gangsters going free. If, for argument’s sake, she is right in her contention that Mr. Russo and others were wrongly convicted in cases overseen by a corrupt federal agent, it is at least possible that the men she is trying to help are guilty of other crimes. The United States attorney’s office in Brooklyn, which prosecuted Mr. Russo and several other Colombo family gangsters, declined to comment on any of the cases that Ms. Clemente has worked on. And, the Justice Department would not comment on the status of her 300-page report. The New York office of the F.B.I., pointing to the failed state trial in 2007 and to the bureau’s own probe of Mr. DeVecchio a decade earlier, has long denied that the former agent was guilty of misconduct. Such responses do not sit well with some relatives of the imprisoned Mafiosi — among them Andrew Orena, the son of Victor Orena, the Colombo family’s former underboss who is serving a life sentence for a murder that Mr. DeVecchio helped investigate and that the elder Mr. Orena claims he did not commit. Andrew Orena is a filmmaker, a not unheard-of occupation for the progeny of mobsters. He is also one of Ms. Clemente’s loudest champions, saying that she has done more than any lawyer in unearthing information that might, eventually, set his father free. One day late last month, Mr. Orena brought Ms. Clemente to a meeting at the Midtown office of Jailbird Productions, a movie company he runs with his brother, John Orena, a former Colombo family soldier who served five years for racketeering, and Anthony Gentile, a veteran of children’s entertainment. The purpose of the meeting was to pitch Ms. Clemente on a biopic about her life and, hopefully, to nail down the film rights to her story. Ms. Clemente seemed reluctant. From the start of her investigation, she has steered clear of the limelight, partly out of concern for personal safety and partly from a natural discomfort with publicity. Four years ago, however, she was diagnosed with cryptogenic cirrhosis of the liver, which over time has withered her once-full frame to a mere 100 pounds. She is waiting for a liver transplant and says she fears for her brother and her son, whom she still takes care of, should her condition worsen. She is not a wealthy woman and the money could help. He went on for a few more minutes about the William Morris Agency and a screenplay in development — “Nick Pileggi was very helpful in the beginning of that process,” he said, referring to the screenwriter — and then the meeting ended. “Based on a true story of tragedy and hope,” the first panel read. As of last week, Ms. Clemente was still considering the offer.